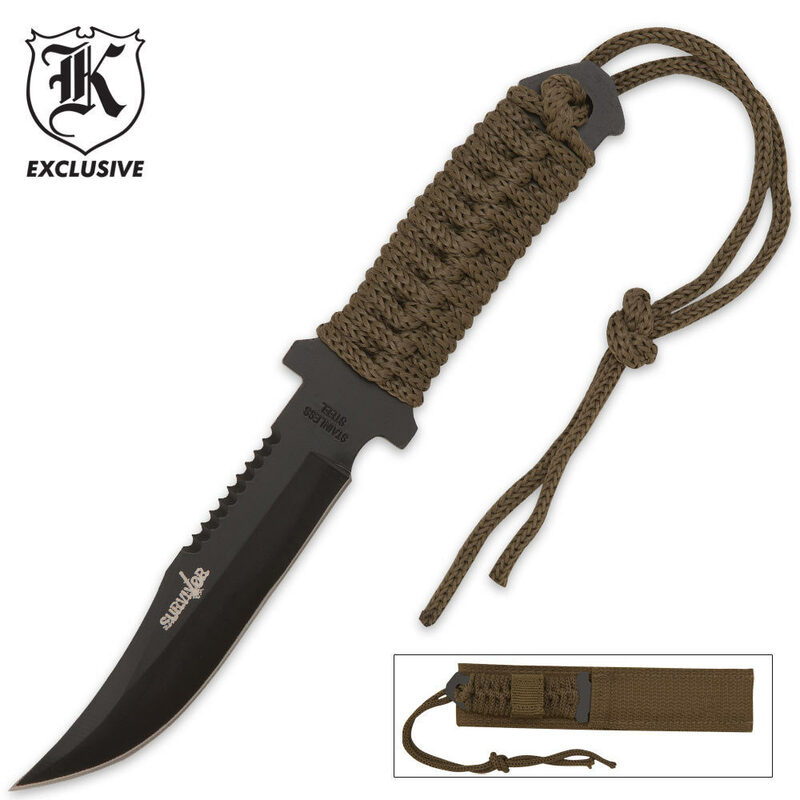 7.5 Inch Overall Survivor Knife | BUDK.com - Knives & Swords At The Lowest Prices! This knife has exactly what you need to survive in the wild! This Survivor Knife is perfect for hunting, fishing, and camping, and features an AUS-6 black coated stainless steel drop-point blade with a sliver edge and “Survivor" etch, and a partial saw-back edge on the top of the blade. The knife is also full tang, with a green nylon cord-wrapped handle with a lanyard. 7 ½" overall. Includes durable nylon sheath. this is a good knife... i guess its not wrapped in paracord so the handle cant really double as anything its small...legal carry in most states id assume, not very sharp and without the survivor etch, i doubt its aus-6 steel, but wouldn't really know. read the description and note that 7 1/2 inches is the whole knife. My friend bought this knife from a flea market, and It had the Budk symbol on it and I immediately knew what knife it was! It has incredible balance, and surprisingly, it throws extremely well!!! If you want a nice little survival knife, don't hesitate to buy this blade!!!! I got the Knife yesterday with this military survival knife, crap, but I love this one it's amazing. It's smarter than I thought but great knifes I give it 10 stars.